Today I have the pleasure of hosting YA author, Kristina Springer. She shares here the recipes for her favorite Halloween treats. Please leave a comment and help welcome Kristina to my blog. I love throwing parties and I love a theme. So when it comes to Halloween, making some fun spooky treats to share with your friends is a must. These are all super easy ideas that anyone can do and young and old will love them! The first one is MUMMY DOGS. These are so simple to make. 1) Get a tube of crescent rolls and a package of hot dogs. 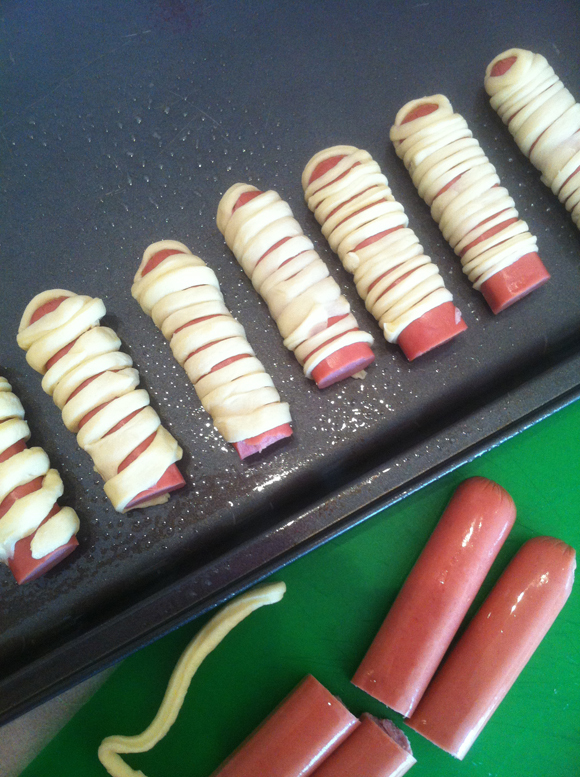 You can make full-size mummies by using an entire hot dog or cut them in half like I did. 2) Follow the instructions on the crescent rolls for pre-heating your oven. 3) Roll out the crescent dough and cut it into really thin strips. 4) Start at the top of your hot dog and slowly wrap it all the way down, leaving a little space for the eyes. 5) Put each dog on the baking sheet and cook according to your crescent roll directions. So easy! And yum. And if you want, add on two tiny mustard eyes once the mummies are cooked. Kids love these. Not going to lie, I make these for my kids just for fun some afternoons. But they're great for parties too. Or a treat to bring your dentist. 1) Slice up red apples (any kind is fine). 2) Spread peanut butter on one side of each apple. 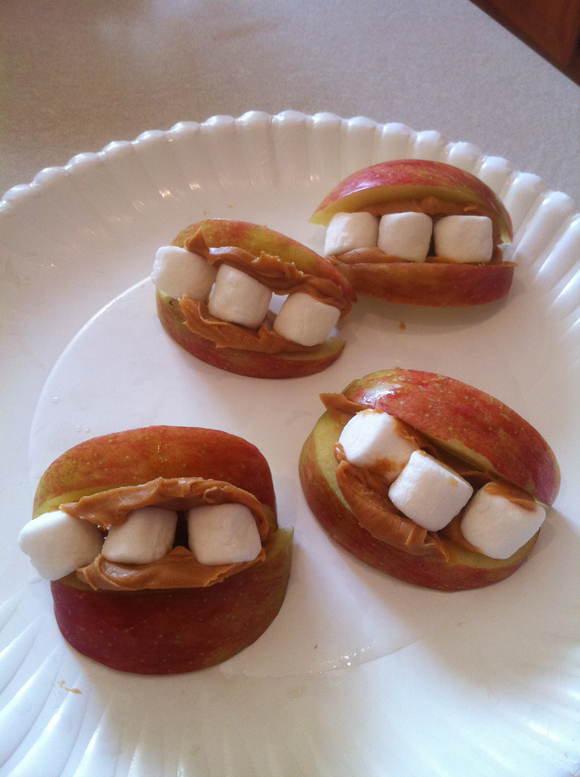 3) Stick three mini-marshmallows on one slice of apple, peanut butter side. 4) Put another slice or apple, peanut butter side down, on top and smoosh together. That's it! Serve right away. I love, love, love this one! And because I like things simple, the recipe is super easy. 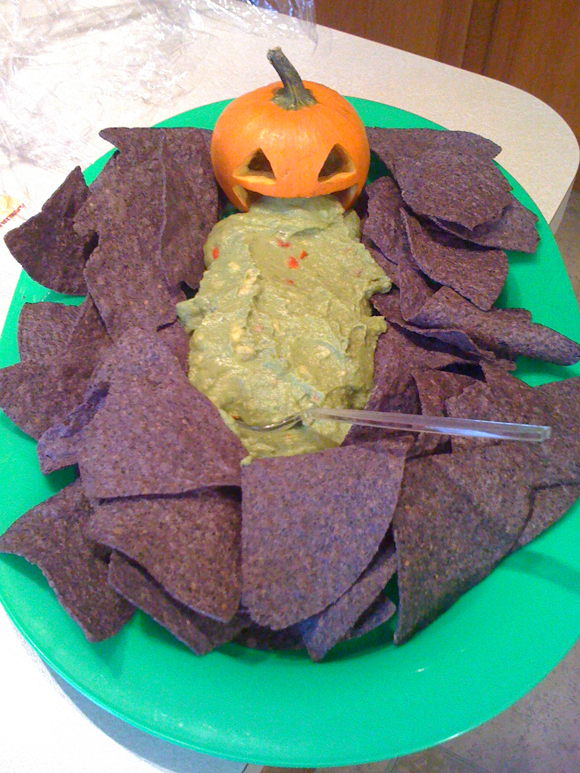 1) Buy a tub of any kind of guacamole, a mini-pumpkin, and some black tortilla chips. 2) Carve two eyes and a pretty big mouth into the pumpkin. Since it's a mini-pumpkin, don't cut off the top. Just do your best to scrape out what you can from the eyes and mouth. 3) Position the pumpkin at the head of your tray. 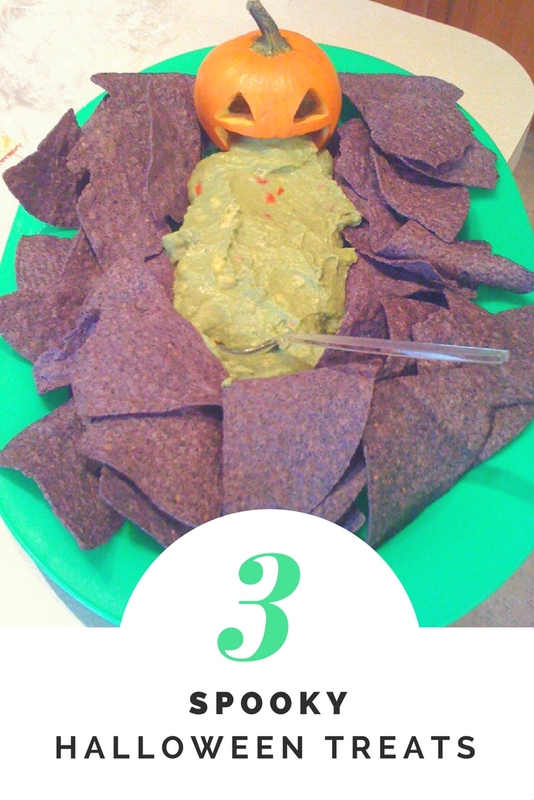 4) Make the guacamole come pouring out of the pumpkins mouth and down the tray. 5) Fill in the sides with black tortilla chips. It's so gross, it's good, right? There you have it! Give one or all of these recipes a try and have a Happy Halloween! Kristina Springer is the bestselling author of My Fake Boyfriend Is Better Than Yours and The Espressologist. Her newest young adult novel, The Paparazzi Project releases December 15, 2012. Visit her at www.KristinaSpringer.com and @TinaSpringer on twitter. I’m making some of these Halloween treats right now! thank you for the recipes. Hi there, You've performed an excellent job. I will certainly digg it and individually recommend to my friends. I'm confident they'll be benefited from this web site. Congratulations on A GOOD MAN becoming a feature film, Vanessa! Exciting! And, my friend just made mummy dogs for us this past weekend--they were good. Just found these spooky Halloween treats on Pinterest and can’t wait to make them soon! Thanks for sharing! I really like the disgusting teeth recipe. I haven't seen that before. I really like the disgusting teeth recipe too. I haven't seen that before. O my those Halloween treats do look really good. Sadly not the healthiest thing to eat though. Thank you so much for these Halloween treats! They were fun to make and even more fun to eat! I am planning on making the apple mouths for my dauther's fall party at school next week. Glad to see someone else has done them too. Found you via momma mixer. Those halloween treats look so good. Thanks, these Halloween recipes are awesome!! They turned out great!! Thanks for sharing with us at FFF. These Halloween treats sound so good! Ha, the apple teeth are great and I'm so making those for my daughter! Ummm, I went home at lunch and made this – snuck in a few pre-dinner bites! It’s in the fridge waiting on me! I’m having some people over tonight, and I’d like to just skip the soup and salad. Cannot WAIT! Mmm – thanks!!! Thanks for the recipes. They look fun and my boys will love them. usually i don't like that vomiting pumpkin, but for some reason in the thumbnail for a linky and here i do. strange! and perfect for strange, lol. Awesome Halloween party ideas in here. There’s too much to prepare for a party! From invitations, decorations, music and especially Halloween Recipes and treats! Gee excited for this year’s Halloween gatherings: D Thanks for sharing and I do hope I could pin some nice photos on my Pinterest boards. Good day! Haha, I think the puking pumpkin is my favorite! I have seen the mummy dogs quite on a few blogs. I must make them on Saturday. Thanks for linking up to #Halloweenlinky Week 3 is live now.